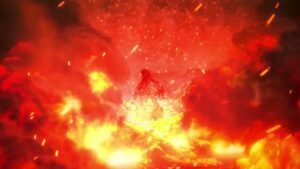 Thanks to an update on the official website, we now know when to expect the Japanese premiere of the third and final Godzilla anime film, Godzilla: The Planet Eater. Theatrical screenings are coming to Japan on November 9, and you can see a brief teaser trailer narrated by Metphies (voiced by Takahiro Sakurai) below. The teaser says, “Now, you’d better kneel down and worship, the golden end.” It definitely sounds like we can look forward to King Ghidorah closing things out for the trilogy.